It’s a new year, and finally, a new voice will be added to the drug war debate. The federal government will actually get scientific input on drugs, and it will make prohibition look all that much more absurd. Surgeon General Vivek Murthy, the nation’s top public health official, will be “presenting the state of the science on substance use, addiction and health,” in the first-ever report from that office. “It’s time for us to have a conversation in this country that’s based on facts; A conversation that’s based on medicine and science. 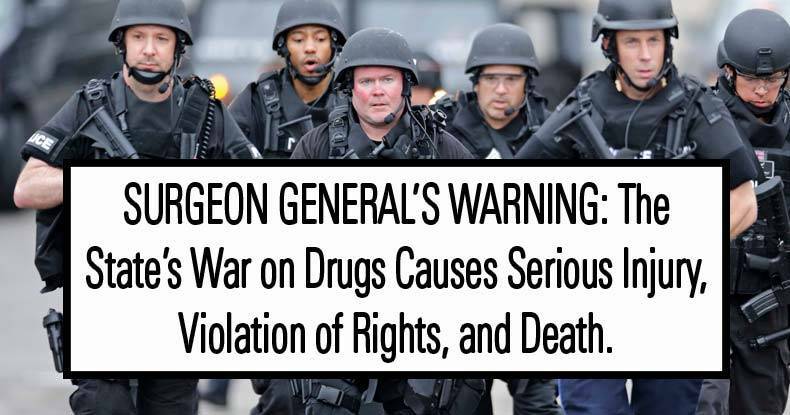 The Surgeon General’s report will also address “ethical, legal and policy issues,” and those conclusions will be eagerly awaited by those who are fighting to end the senseless, immoral War on Drugs. The fact that 23 states in the U.S. have recognized the benefits of medical cannabis, legalizing its use, should be reason enough to invalidate the Schedule 1 classification. A landmark study presented at the American Epilepsy Society showed the astonishing effectiveness of the cannabis extract cannabidiol (CBD) for treating epilepsy. The National Cancer Institute admitted that cannabis kills cancer cells. People use cannabis to treat a variety of conditions that arise from inflammation, such as Crohn’s disease and nerve pain, yet are being arrested for it and having their kids taken away. We can only hope that the Surgeon General’s report serves to cure the primitive mindsets that still inhabit government, such as DEA chief Chuck Rosenberg who said medical cannabis is “a joke.” Tell that to the countless children whose lives have been saved by this incredible plant. To the drug warriors – child suffering – is a joke. In the broader sense, the report should serve as a catalyst for government to change its stance on drug use and addiction. Instead of criminalizing this behavior—throwing people in jail, ruining lives and breaking up families—drug abuse should be treated by physicians and addiction centers. The Centers for Disease Control and Prevention presented data on drug overdose death rates from 2001-2014, and it does not look good. In addition to this, “alcohol is killing Americans at a rate not seen in at least 35 years”—increasing 37 percent since 2002. These deaths are from causes such as alcohol poisoning and cirrhosis, and do not include deaths from drunk driving and other accidents. Contrast these statistics with cannabis, which has caused zero overdose deaths and causes virtually no driving impairment. Clearly, the U.S. government’s approach to drugs is a failure. The criminalization of certain drugs, and the complicity in the use of alcohol and prescription pills, has only exacerbated the problem of abuse to epidemic proportions. Portugal, which took the opposite approach in 2001 by decriminalizing all drugs, has seen a drastic decline in drug use, overdoses and crime. If the scientific input of the Surgeon General has any influence on government’s approach, we should move rapidly toward ending prohibition so drug abuse can be properly addressed. It will also highlight the fact that cannabis has potent medical benefits and causes no overdose deaths, which by any logic should bring decriminalization and freedom to Americans who use this plant.